Providing clean water for people to drink is one of the biggest challenges facing our world. Some countries struggle with water-borne diseases. Others face natural pollutants such as arsenic or man-made pollutants like textile dyes or pharmaceuticals. One way to remove pollutants from water is to use activated carbon. This is carbon with lots of small holes, or pores, and it has a very high surface area. Activated carbon is normally made from various biological materials such as wood, nut shells, peat or coal. If these are heated in an inert atmosphere (no oxygen), they will turn into carbon. However, the carbon that is produced isn’t very porous and won’t adsorb pollutants. To introduce pores into the carbon, the biological material can be heated to high temperatures in steam. The steam reacts with the carbon to make carbon dioxide and very tiny holes are left behind in the carbon. Another option for making activated carbon is to use chemical treatment. In this case, the biological material is soaked in acid, base or a strong salt solution before being heated. This also makes small pores in the carbon. Once the carbon is full of small pores, it is very good at adsorbing organic molecules. These go into the pores and stick to the surface of the carbon. This is how activated carbon is used to remove pollutants from water. Despite the range of activated carbons available, they can be too expensive for large-scale water treatment. Also, new types of porous carbons are needed. 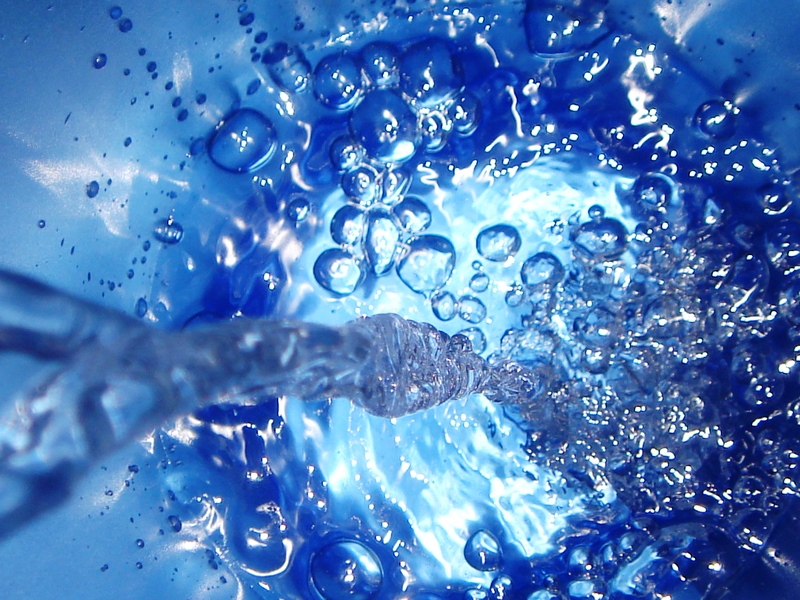 This is not just for water treatment, but for applications such as batteries or fuel cells. Find out more about carbon here. A pdf version of this experiment is available here. Please ensure you refer to the safety card. Details for teachers or technicians can be found here. The ability of carbons to adsorb pollutants can be tested using dyes. The coloured molecules are adsorbed onto the carbon and this can be easily monitored by the loss of colour from a solution. In scientific research, a compound called methylene blue is often used. However, food dyes such as E102 or E133 can also be used. Weigh 1 g of activated carbon into a beaker (make sure you label the beaker). Measure 100 mL of a dye solution into the cylinder and add to the beaker. Stir for 5 minutes and observe any colour loss. You may need to filter the mixture to remove any carbon powder. But beware; some dyes are adsorbed onto filter paper. Repeat this using 1 g of crushed charcoal and compare the two solutions. Try the same experiment with 0.5 g, 1.5 g and 2 g of activated carbon. Make sure you keep a ‘control sample’ of the original dye solution so you can compare the colour with your experiments. Try the same experiment with some different dye solutions. 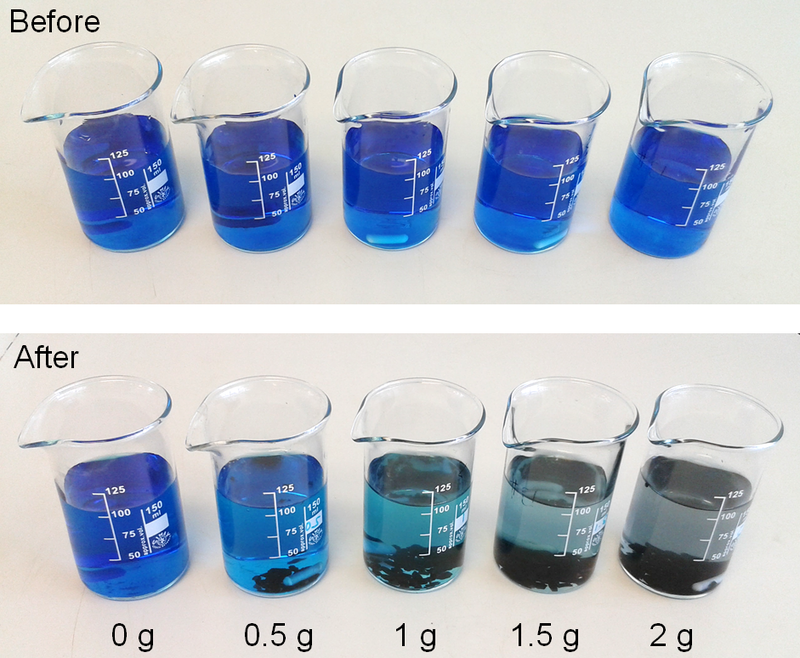 Is there a visible difference in the decolouration of the dye solutions between charcoal and activated carbon? How much activated carbon do you need to add to completely remove the colour from the solution? Calculate how many grams of dye can be adsorbed per gram of carbon. Why does activated carbon adsorb dyes? Look up the chemical structure of some of your dyes. 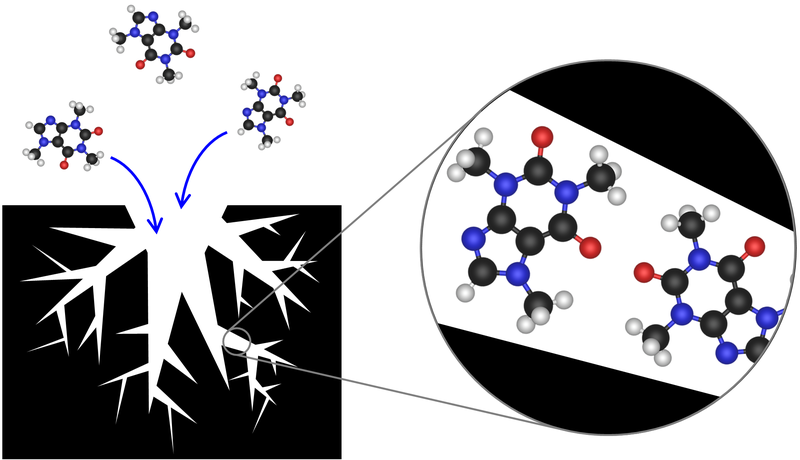 What features of the molecules might mean they can be easily adsorbed onto activated carbon? How do different dyes compare? Discuss with your teacher why this might be. It’s easy to see visually that the colour has gone from the methylene blue solution. But it’s also possible to analyse this more accurately using a technique called UV-Vis absorption spectroscopy. The peaks in the graph show where light is absorbed by the solution. When 2 g of carbon is added, no light is absorbed by the solution (no peak). This is because the solution is now colourless. All the coloured molecules have stuck to the solid carbon. If you want to plot the graph yourself, download the file here. You could also try using activated carbon to remove coloured molecules from everyday products. We tried blue powerade, ribena and ironbru. We found that a lot more activated carbon was needed compared to the pure dye solutions. This is probably because the drinks contain lots of other molecules such as sugars and flavours. In the School of Chemistry at the University of Birmingham, researchers working with Zoe Schnepp have been developing ways to make new types of porous carbon from waste materials like sawdust. The process is similar to those used for making activated carbons. Sawdust is mixed with a solution of iron nitrate and then heated in a furnace in an air-free environment. The iron is dispersed over the woody fibres and during the heating process, the iron compounds break down to form nanoparticles of a material called iron carbide. This is perhaps more familiar as one of the components of steels. The iron carbide nanoparticles ‘burrow’ into the biomass, a little like a rabbit burrowing through the ground. What is left behind is essentially a carbon nanotube and so the result of the process is a solid material that looks a lot like charcoal, but is full of very tiny hollow tubes, each one over 1000 times smaller than a human hair. We can see these tiny tubes using a technique called electron microscopy. The first picture is at low magnification. It shows the structure of the wood that has been kept in the carbon. The tubes are what help the tree to transport fluids. The second picture is a much higher magnification. It shows the tiny carbon nanotubes looking a bit like strands of spaghetti tangled together. You can tell from the scale bar that each tube is only about 50 nm in diameter. An average human hair is 100 μm in diameter, that’s 2000 times larger! This research is fascinating as it is a way of making a carbon material with a really complex structure using a waste material, sawdust. In the next stage of the research, the scientists on this project are seeing if the same chemistry works with other waste biological materials such as straw, or nut shells. This new carbon material has some fascinating properties. It contains carbon nanotubes and so it conducts electricity. This could make it useful in applications like batteries. It has a high surface area because of all the tiny tubes and so it could be useful in water filtration. Find out more about this research here. This work has been summarised in the press release found here. The full publication can be found below.